So you've just bought Windows 7, but now need an something to protect your investment from nasty viruses and spyware lurking out there on the internet: Microsoft's Free Security Essentials may just do the trick. Microsoft recently released a Free Anti-Virus and Anti-Spyware package called Microsoft Security Essentials. The package is compatible with Windows 7 and earlier operating systems and is fully certified by ICSA Labs and West Coast Labs Checkmark Certification. Microsoft Security Essentials provides real-time protection for your home PC that guards against viruses, spyware, and other malicious software. It provides comprehensive protection against malware and features automatic updates that occur in the background when you’re connected to the internet. Microsoft Security Essentials is a free download from Microsoft that is simple to install, easy to use, and always kept up to date so you can be assured your PC is protected by the latest technology. It’s easy to tell if your PC is secure - when you’re green, you’re good. It’s that simple. For Windows XP, a PC with a CPU clock speed of 500 MHz or higher, and 256 MB RAM or higher. For Windows Vista and Windows 7, a PC with a CPU clock speed of 1.0 GHz or higher, and 1 GB RAM or higher. VGA display of 800 × 600 or higher. 140 MB of available hard disk space. An Internet connection is required for installation and to download the latest virus and spyware definitions for Microsoft Security Essentials. Windows Internet Explorer 6.0 or later. Mozilla Firefox 2.0 or later. Microsoft Security Essentials also supports Windows XP Mode in Windows 7. 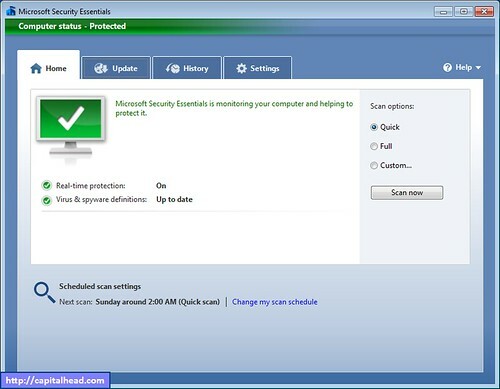 Microsoft Security Essentials is a great companion for your new Windows 7 operating system. It leverages Microsoft’s investments in the Forefront family of products to allow home users to enjoy a similar level of protection. It is certainly a far cry from the Defender days. The software is unobtrusive, easy to use, efficient - but best of all it’s free.